A child goes through a lot of changes on the way to adulthood. These changes put strain and pressure on their bones as well as their digestive and immune systems. 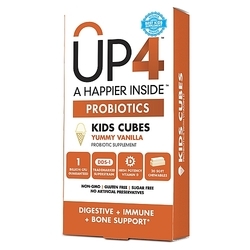 UP4» KIDS CUBES are soft, creamy chewables that feature our trademarked superstrain Lactobacillus acidophilus DDS¬-1 and Bifidobacterium lactis for full digestive and immune support. * In addition, each cubes contains 800 IU of Vitamin D3 to support healthy bone growth in children.